save more than a PUMPGUARD on piping costs. THE BEST INVESTMENT IN THE PUMP BUSINESS. Hydraulically Operated Double Ended Diaphragm pump. 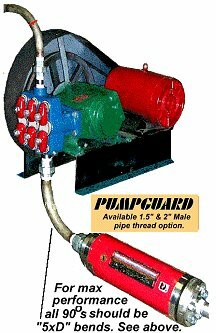 The PUMPGUARD was installed between a pair of suction filters and the pump suction manifold. 1. Tripled time between filter element changes. 2. A 6% increase in flow rate. 3. A db reduction 72 to 58, Paid for itself in 16 months.